Wow, two months since the last post. Work has been insane, and I've been spending a lot of my free time working on the house. Honestly, by the time I sit down I'm usually beat. I decided to skip posting most of the pictures in-line with the post. It takes way too long, and I'm having trouble keeping up with posting new entries as it is (evidenced by the lack of posts since April). It might be because I uploaded the pictures to my other google account, and the big G seems to have trouble swapping accounts in certain applications (blogger and picasa are two I've noticed), so the whole process becomes much more onerous. I will post the links to albums once I've finished the trip notes. Anyway, here's the skinny on day 5 of our trip to Disney (Epcot). "Where are the rest of the Disney posts?" Right? I'll get around to it. In the meantime, I'm trying to reorganize my notes. We are coming up on the 1 year anniversary of Talen's diagnosis, and just passed the 1 year anniversary of Chris's murder (another story, maybe I'll post another time), and I'm trying to pick back up some of the things I dropped last fall. I'm cleaning up the links, putting the originating organization and date on each. I am also putting a brief summary of each treatment on the page (no more than a couple of paragraphs) and a super-short synopsis at the top of the page. I wanted to share a great opportunity with you. One of our Camp Counselors from last year’s Summer Camp was so touched by what MDA does that she has started a 5K to raise money for MDA. If you are like me, you probably don’t run yourself, but know people who do, so I wanted to send this along so you can share with any friends you have who are runners. If you have any questions, please let me know! Day 3 of our trip was actually our second day at Disney World in Orlando. We had made a number of reservations at restaurants *way* ahead of time, so our itinerary was defined in terms of which parks we would be going to. We hopped out of bed a little late due to our late stay at the Magic Kingdom the day prior, shoved some snacks in our faces, and rushed out to the bus stop to head back to Magic Kingdom. I noticed recently that a lot of the research on exon skipping has started to focus on a new, non-morpholine based compound named Dantrolene, which is currently FDA approved as a muscle relaxer. The first few times I came across it I knew I had heard the name before, though if I'm being honest, names start to blur together at some point. I did eventually remember where it was that I had first heard of Dantrolene, though. You're thinking about sticking this in your ryanodine receptor right now. We went to our follow up appointment at Levine's Pediatric Orthopedic Surgery on Wednesday (Feb. 13th), and Talen got the green light to get back up on his feet and start walking. Of course he had to immediately give it a go, and he was shaky but demanded to walk out of the doctor's office. Ok, I'm attempting to attach the pics to this post in the ios blogger app. Am I doing this right? Oh my god. He is struggling with walking for more than a short distance, and the stairs are more of an issue now than ever, but given the six weeks off of his feet and the degree to which the DMD accelerates the decline in muscle tissue during periods of inactivity, it seems almost miraculous that he is even standing. He seems to want to keep his foot turned outward right now, which you can somewhat see in the picture above. Lisa is going to be scheduling visits with Scott at the MDA clinic to see about physical therapy. Hopefully the struggle to get fully mobile will just be a temporary thing. If I'm being honest, though, my biggest fear regarding this whole situation is that the fracture and subsequent period of time off his feet will trigger a rapid decline in mobility that he won't be able to recover from. I tend to be pessimistic though. Talen only seems to be capable of looking on the bright side, so I'm trying my best to follow his lead. He's back in school now, and that's a whole other bag of worms. He has been working hard to get a handle on literacy skills, and before the break he was making pretty big improvements. It's hard to say how much this might set him back. But worries and doubts aside, the main point is that he's back upright and out of the wheelchair. If there is a silver lining to be had, it came in the form of a discussion with the orthopedic surgeon. I asked her about the nature of Talen's break. It seemed very abnormal to me, and she agreed that it was not typical. I asked a number of questions about the general lack of bone density in kids with DMD, because I had been told by one neurologist that DMD patients frequently suffer from osteopenia caused by the muscular systems inability to stimulate bone growth (similar to how a sunflower will generate a thicker stem when subjected to wind or some other outside interaction). 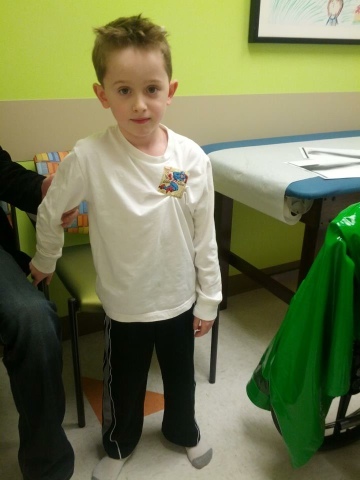 The orthopedic surgeon told us that with Talen's late diagnosis that he probably wasn't suffering from any sort of osteopenia, that it is typically seen in kids who are so severely affected that their diagnosis occurs very early. We will be meeting with his pediatrician at some point to check vitamin d levels and other indicators that will verify, but this is promising news. If you're anything like me, you get all hot and bothered about eukaryotic initiation factors and you're just dying to read more about exon skipping. The rest of you need to get with the program. Here are some links for anyone interested in diving deeper into exon skipping. 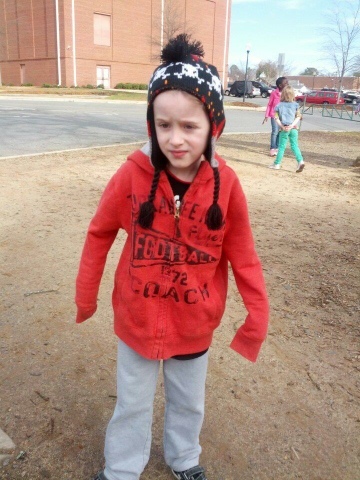 When you tell someone that your child has Duchenne Muscular Dystrophy, more often than not you get this blank look from them while they try to gauge your demeanor to figure out just how serious it is. Most people have at least heard of the disease, but the impact of DMD isn't something the average person tracks until it affects them, and it's difficult to reconcile that someone as happy and full of energy as Talen could be afflicted with a terminal wasting disease. Once the severity sinks in, one of the first questions people ask is, "Can they treat it?" Currently the answer is, "Not really." There are a number of treatment options under investigation, and I have been attempting to catalog avenues of research at Toomee.org. I have not had time to work on it recently, but I'm committed to comprehensively logging all of the research that is publicly available. However, there are a couple of items that I think are very close to being accessible which bear addressing specifically. I'll dive into details after the jump, but the two main avenues of investigation that we are excited about right now are exon skipping and utrophin upregulation. We'll dive about an inch deep into exon skipping here and talk about utrophin in another post.